Is luck, like, real? Does the universe bestow runs of good fortune or bad, and can we actually tip the scale with rabbits’ feet, four-leaf clovers, spellcasting, and other tools of the magic arts? Don’t laugh. These are serious questions—some of the world’s sanest people believe luck plays a role in their lives. And others, as we all know, take the knock-on-wood, number-thirteen, black-cat superstition game to absurd lengths. What role does Lady Luck play in your life? This week’s interview features the author and illustrator of a delightful new graphic novel that does the deepest of dives into superstition. 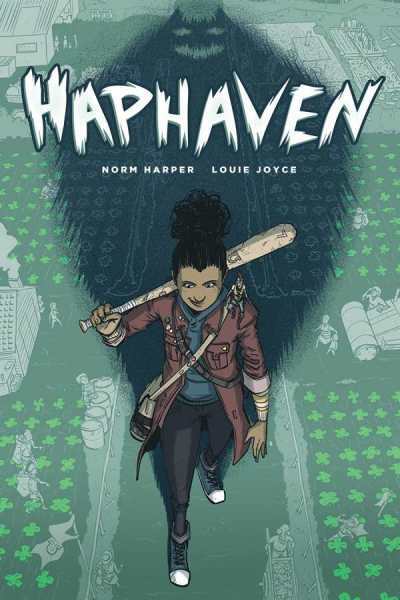 Norm Harper and Louie Joyce created an alter-ego world to Earth, a place named Haphaven, from where all of our superstitions derive their power. The book is brilliantly conceived, and when Peter Dabbene’s review for Foreword’s March/April issue came back so favorably, we quickly contacted Lion Forge to set up an interview. 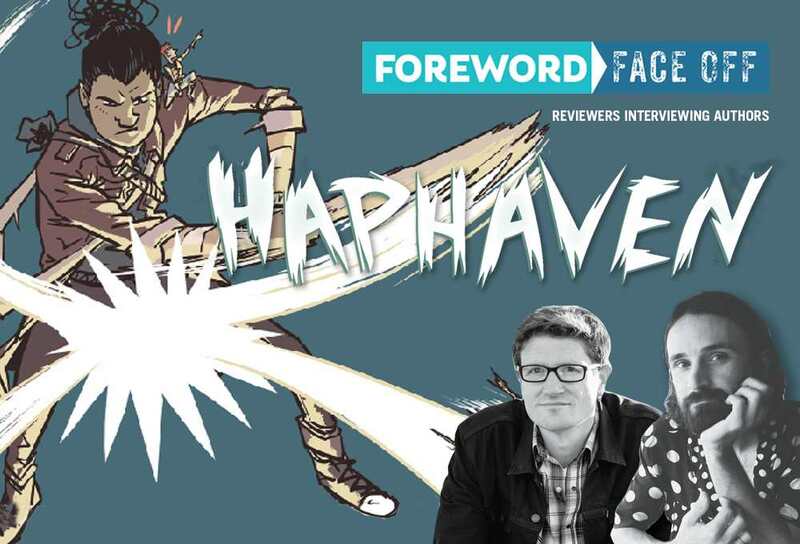 Haphaven reminds us that certain stories are best told in the graphic novel format. You’ll love this one, we promise. Enjoy the interview. How did the idea for Haphaven come to you? What inspired the name? NH: I had thought that uniting the collective folklore that we call “superstitions” under a single mythology would be a great basis for a story for a long time. And I was actually working on a completely different version of it a few years back—it was kind of an action comedy where a family was fighting off literal bad luck. But to make that story work, I had to establish the rules of luck, and figure out why all these things like four leaf clovers and black cats and rabbit feet could actually impact your fate. So, I came up with the idea for this other world that was linked to Earth and it really just took off from there. I knew pretty quickly that this other world was going to be a much more interesting story that the one I was planning. Your thirteen year old heroine, Alex, wields a wooden baseball bat with a horseshoe carved into it, and throws spilled salt over her shoulder. What’s your favorite superstition? Are either of you superstitious in your day-to-day life? LJ: I’m not particularly superstitious day to day. I will knock on wood, but won’t go out of my way to do so if there’s none around, and my son and I like to avoid stepping on cracks as a fun game. My favorite superstition is probably the one that’s stuck with me the longest. I have this card with a Balinese mask design printed on it that’s supposed to protect against evil spirits. My parents gave it to me to put above our childhood treehouse. It’s managed to stay with me all these years and now hangs above the door to my office. It’s only stuck on with blu-tack though, so when it falls down I do get a slight chill! NH: Nowadays, I don’t hold to any traditional superstitious beliefs, but when I was a kid I was really big on the superstitions that involved an object—rabbit feet, horseshoes, four-leaf clovers. I loved the idea that I was possibly holding real magical talismans. The most common version of the “throw salt over your shoulder” superstition prefers the left shoulder, while Alex throws over her right. Any significance to that? LJ: Hahaha, potential oversight there! Though Alex is very strict on her superstitions, I think she’s also capable of being quite brash at times, especially when upset. I mean, how many people so readily up and join a leprechaun on a journey to another world!. NH: It is definitely in Alex’s character to be a little too brash and make that mistake. But the truth is, we also had to occasionally take some poetic license and tweak a few superstitions to tell the best story possible. If the camera angle Louie chose favored the right shoulder, and the script didn’t have a good reason to specify the left shoulder, then we’d go with the better art composition rather than a strict adherence to the superstition. We were already rewriting the rules anyway, so those kinds of editorial decisions just became part of that. Did you research superstitions, or just use ones you already knew of? Anything you found that you didn’t know before Haphaven? LJ: I did do a bunch of research on different superstitions and beliefs. I knew the main ones we were touching in the story, but wanted to be aware of many others so I could add in little references or easter eggs wherever possible (a lot of which you see carved onto her bat). It’s an incredibly interesting subject, especially when you start looking at how different cultures have their own unique superstitions, or how they change and adapt cross culturally. At the end of the day, this book is really about Alex’s story, but I think there’s still a whole lot of potential for what could be explored in the world of Haphaven! NH: Yeah, when I started researching, I was really surprised to learn how much these superstitions could vary. I was familiar with black cats as a bad omen, but in other parts of the world they’re considered good luck. I always saw horseshoes hung points up over doors, but in some places and at different times, they’re hung points down. Wherever we could, we tried to incorporate all interpretations—we hang the horseshoes both ways, for instance. But other times we had to pick the version of the superstition that most served telling Alex’s story. Your leprechauns aren’t typical—one, Penny, wears a Mohawk and rides a tiny motorcycle, while another farms a crop of four-leaf clovers. How did you decide when to use traditional ideas (leprechauns being small, for example) and when to stray from tradition (green top hats and the like)? LJ: For me it was about taking one or two points of similarity (mainly the height, but also some color direction) from our existing ideas of a leprechaun, and building from there to create a diverse race of beings that function as a civilization. In Haphaven, leprechauns are as wide and varied in how they look, what they do, what they eat, how they interact, as humans are on Earth. Which is great because it gave me a lot of freedom and adds more visual interest to the book. But I think it also speaks to the larger story and it’s a really important moment in the book when you see [the Haphaven leprechaun] Hubbub’s reaction to Alex’s leprechaun trinket/toy. It sets up that notion that’s things are rarely as simple as they appear, or as you want them to be. There’s always far more nuance and complexity involved, which Alex learns firsthand on her journey! NH: Having the leprechauns feel real was super important. And giving them variety was a huge part of creating that realism. But I will say, there was originally a character named Smidgen Stonewick who was intended to represent a more traditional leprechaun. He was Hubbub’s partner and came with him to retrieve Alex. But, between Hubbub and Penny, there wasn’t really anything for Smidgen to do in the story other than be a comical thorn in Hubbub’s side. And Penny was doing that well enough on her own. Plus, the book rewrites the rules of all these familiar superstitions, and we really wanted to let the reader know early on what to expect. The leprechauns are Alex’s first interaction with anything from Haphaven, and Hubbub’s contrast to the typical leprechaun—and his disdain for Alex’s leprechaun toy—really helps tell the reader, “forget what you know,” and invites them on the journey in the same way that Hubbub is inviting Alex along with him. I think having the more traditional Smidgen along in that moment would have undercut that. So, Smidgen ended up getting cut out of the main adventure. But he does survive in the final book as the unseen author of the Haphaven history that you get at each chapter break. So maybe we will get to meet him someday. Alex has to confront her own beliefs and doubts throughout the book, and Haphaven could be called a coming of age story, albeit, an unusual one. Was Alex’s age part of your vision for the book from the beginning? NH: Absolutely. That’s probably the one thing that survived from that original story that I mentioned earlier— thirteen-year-old protagonist. Thirteen as an unlucky number is one of those universally known things. A leprechaun arriving to whisk you off on an adventure in another world is always going to be a fantastical experience. But I think having that happen to Alex on her thirteenth birthday adds an extra dose of magic to the moment. Haphaven is a fascinating, richly detailed world. Maybe it’s just the fact that they have talking rabbits and nutty royalty in common, but it reminds me of Wonderland, with Alex as a modern-day Alice. Any plans to return to Haphaven for future projects? LJ: I’d absolutely love to return to Haphaven one day! I remember reading the script and catching these hints that Norm put in to other places and characters within Haphaven. Little throwaway lines, but they completely triggered my imagination and I couldn’t stop thinking about the larger world and its history. You can see me working some of this out in the background of one particular section of the book, and when I was drawing the map illustration, I purposefully focused it on the locations important to the story so there’s room to return and expand if we wanted to! NH: Nothing is set in stone right now, but going back to Haphaven would be a joy. There are so many corners of the world of Haphaven that we just hint at in this book. And I’m as curious about where they lead as anyone. Plus, we have to meet Smidgen.